Lenovo Tab 7 TB-7304i Tablet features a sleek and slim profile that makes it highly portable. This Lenovo Tab is available at Souq.com. Work or play while on the go with the Lenovo Tab 7TB-7304i Tablet. It features a slim and sleek design that lets you conveniently carry it wherever you go. The slate black finish of this device lends it an impressive look. This tablet features a 7inch HD IPS screen that delivers a stunning visual output. Its MediaTek 64-bit Quad-Core processor of up to 1.3 GHz ensures a smooth performance. Also, this device has a 1GB RAM that makes multitasking a breeze. This tablet is designed for the entire household as it features multi-user capabilities that let everyone in the house create their own account and space. The front-facing speaker backed with the Dolby Atmos Technology delivers a loud and clear audio output, so you can thoroughly enjoy your favorite music tracks, movies, and videos. It runs on the Android 7.0 operating system that keeps you entertained with multiple apps. Storing your work data or media content is convenient, thanks to the 16GB ROM of this device. It supports 3G connectivity, allowing you to browse the internet at a fast speed. 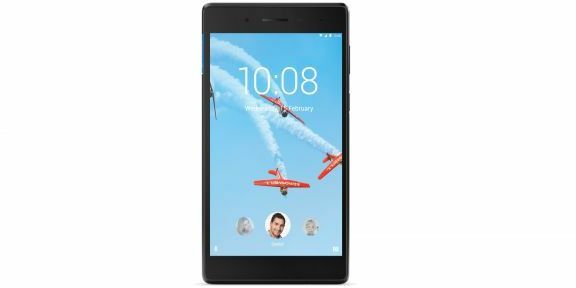 The Lenovo Tab 7 TB-7504X Tablet runs on a MediaTek 64-bit Quad-Core processor of up to 1.3 GHz that helps it deliver an excellent performance. Thanks to the 1GB RAM, you can quickly and smoothly switch from one app to the other. The Android 7.0 operating system of this device gives you access to multiple innovative features that you will love to explore. The 16GB internal memory offers enough space to store all your favorite media content. Moreover, the powerful battery of this tablet lets you play games or listen to music for up to 15 hours on a single charge. This Lenovo Tab is designed with a 7inch IPS screen that displays content with excellent clarity. With a resolution of 1280x720p, the screen renders lifelike visuals so that you can enjoy your favorite movies thoroughly. The built-in front-facing speaker backed with the Dolby Atmos Technology delivers rich and powerful sounds. This Lenovo Tab weighs less than one pound and is easy to carry. It features a sleek body that has a thickness of just 8.4mm. Featuring the multiuser sharing feature, this tablet is ideal for your entire family tablet. It lets every individual maintain a separate personal profile with a dedicated interface and storage. 91.9% of users recommend this product to a friend. Working well, not bad for kids use. a bit slow. good value for money.